Technology is a vital part of learning today. It is a powerful learning tool that students can carry with them into high school and beyond. We are proud to provide the latest technology in all our classrooms, which we introduce at age-appropriate intervals. Each teacher receives training specific to the resources we provide so they can maximize the use of devices in their classrooms. Provide training and support to ensure that all faculty members become proficient in the use of the technology available to them in the classroom. 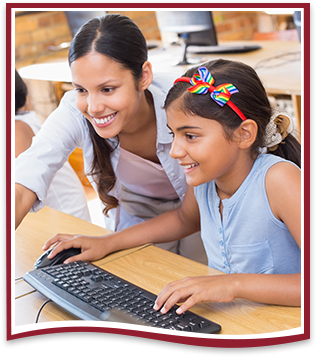 Improve student academic achievement through the use of technology by fully integrating technology into the academic curriculum. Ensure that teachers, staff, and administrators are involved and that they are proficient in the use and integration of technology through professional development activities. Ensure that all schools have the capacity, infrastructure, staffing, and equipment to meet academic and business needs for effective and efficient operations. Ensure that all schools are positively involved in collaboration and partnerships that support the use of technology and develop curricular integration. Our district covers 2,000 square miles and has five separate school libraries. Each library is open to the public; however, the majority of its material is geared toward the student’s reading/interest levels it serves. All libraries are linked together and are fully automated for more efficient use and better access to library holdings.